We know you want to get rid of your debt, but do you ever wonder why you have it in the first place? This year we held Australia’s biggest millennial money survey. We’re spending the next few months trying to unravel the parts of our economic lives that cause us so much anxiety. Stick with us, we’re all in this together. Recently, we wrote an article exploring the future of the economy where we learned that in order to stay on top, higher education is key. The only problem is that university is very, very expensive. An entry level undergraduate degree, on average, is worth between $15,000 and $33,000 a year without subsidies. And given that’s pretty much required to get a bartending job these days, it’s likely you’re gonna end up with copious amounts of student debt. But how did we get to this point? Where the skills you need to get a job that will pay you a living wage require you to go into a decade of debt? It’s especially frustrating considering that between 1974 and 1989 education was free. Well, believe it or not, free education was scrapped in order to make university more accessible for everyone—especially those from lower socioeconomic backgrounds. When Australia’s 21st Prime Minister Gough Whitlam introduced free university and student income in 1974, it was to address issues such as the financial and geographical limitations placed on many students. Ultimately it worked, with enrolments increasing the next year, but it didn’t completely fix the problem of uni being accessible to people from all financial backgrounds. Throughout the 80s, the number of students applying continued to rise. But universities were entirely government funded, and struggled to expand and allow for more enrolments. So despite being free, research showed that typically disadvantaged students with less academic support in school, who were getting lower year 12 results, were still missing out on spots. Universities remained privileged spaces. By the late 1980s, John Dawkins, the Minister of Employment, Education and Training under Bob Hawke, wanted to shake things up again to address this. In 1988, the Higher Education Funding Act (HEFA)—intended to increase the “diversity, equity and quality” of Australian higher education, while simultaneously making our universities internationally competitive—was introduced. One of the key aspects in this bill was the Higher Education Contribution Scheme (or HECS), a concept engineered by economist Bruce Chapman. The original concept was that higher education would have students contribute part of a government-regulated fee. That contribution was $1800 (around $3700 nowadays) per annum, which was roughly 20 percent of a course’s worth. If a student couldn’t pay outright, they could take up an income-contingent loan. And once the student started earning a steady salary, it was paid back through the tax system: one percent for any earnings over $22 000, and three percent for earnings over $35 000. This method eliminated any risk of default, a very real problem in the American Stafford Loan system. He’s referring to the massive HECS reforms that came in that year. They included lowering the salary amount to start repayment, an average of 40 percent fee increases, and a three-tier system charge system based on not only on the courses' worth, but their related earning power too. This is the point when student fees started to snowball. Shortly after, under the 2003 Higher Education Support Act, HECS became HECS-HELP, a greater loan system that included overseas students and full-fee domestic students. But, more significantly, it also saw universities permitted to increase student contributions by 25 percent. From there we saw all early payment discounts and overseas students loans abolished, as well as a perpetually growing increase of university costs. As for the future of these fees? Director of the Centre for Global Higher Education Simon Marginson theorises that they’ll continue to rise until students are paying entirely for the course themselves. “It’ll keep going up. It’ll go up to 100 percent over time...That’s what’s happening. It’ll just take some time,” he told VICE. Now, let’s be real for a second: universities aren’t encouraging raised fees in some villainous way to steal your money. But they do obviously benefit from the trend. According to Simon, for a university to have a competitive academic ranking, it needs to fund its research. As grants don’t cover all the costs, “the profit of international students” and “taking part of the funding of domestic students” can help fill the gap. And as much as excessive fees may seem counterintuitive to growing student enrolment, more recent evidence shows it makes little difference. Cost won’t keep people away. In 2012, the UK introduced full student repayments, seeing costs triple to roughly £9000 a year. Although admission rates dropped that first year, they started to bounce back the following one. 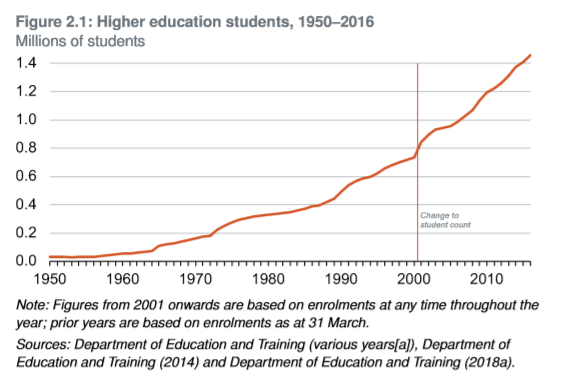 In Australia, enrolments have been perpetually rising despite these continued reforms. But considering that the undergraduate employment rate is 86.5 percent, this is more a case of higher education being a necessity, rather than an indifference, to cost. “Once [university] participation is 20 or 30 percent, then the whole middle class is pushing to be there. To not have a degree becomes a real problem, it takes you out of parts of the labour market and social esteem,” Simon tells VICE, adding that Australia’s participation rate is over 50 percent. In fact, research shows that certain groups are decreasing. While the UK saw overall enrolment growth following those aforementioned price hikes, part-time students dropped by 50 percent in 2015—mainly due to the rising fees and changes in loan accessibility. Now in Australia, our loan system is different, but what this indicates is that certain groups have the potential of decreasing. The bummer is that while HECS was brought in to make unis more inclusive and accessible, it’s been tweaked and changed so much over the decades that it doesn’t really represent those original ideals. One thing is clear, though: uni fees have always been a social and political battleground. Check out the rest of our Payday content here. Follow Sam on Twitter .